Clients report that they struggle to blog. They intend to write but it doesn’t happen. Or they’ve lost their nerve for one reason or another. Here are the top reasons for getting the Blogging Blues. I hear you. But I’d keep writing anyway and here’s why. We entrepreneurs and small business owners keep inventing and reinventing ourselves and our products and services all the time. There’s no perfect. There’s no place you’ll come to where you’ll be satisfied with your website. You’ll be satisfied “for now” but you’ll be amazed how quickly you want to tweak it again and re-position yourself. Keep writing and blogging throughout all of this and you’ll have plenty of content for visitors to read when you want them to come. You cannot wait until that point and then blog, you’ll always be behind. Create content now. The very act of doing it will help you get clarity around the business proposition and your website as you go. What will my friends and family think, and my colleagues at work before I leave my day job? You are not writing for your friends and family and work colleagues. They are never going to be your clients or buy your products and services and they are likely not to be marketing experts nor understand the business reason for blogging. By all means be circumspect in what you write. 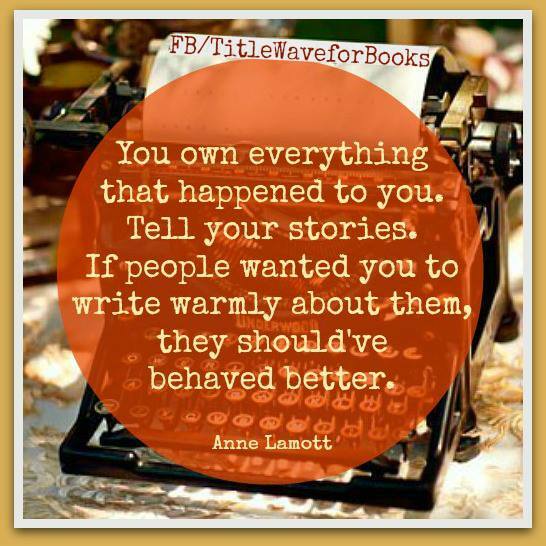 Write only your own truth, do not name them or put words in their mouths or slag them off. Goes without saying. Their story is their story and yours is yours. Write yours only. And if you are worried about work colleagues before you leave the day job, don’t draw attention to your blog and/or protect your privacy on your website and blog. Call your business something other than your own name or write under a nom de plume, for now. Keep writing anyway. Perhaps not, but you’ll definitely get better at it by writing more often. Keep writing anyway. We all need the practice. I wonder why this is. Is it some variant of all of these reasons, some hybrid of them? What would it take to create a habit and stick to that come hell or high water? Pick once a week to start. Write one every week, whatever happens. At the outset you are a lone voice in the wilderness, by which I mean there are millions of blogs online and initially no-one will know you are blogging if you don’t want them to know. So keep writing anyway. Make the time. Open your website and sit there with the blank page and the cursor winking at you. Something will come to you. You are not a person devoid of opinions. Share one with us. Just a thought which you expand into three paragraphs. That’s a blog. Think of your eventual clients and customers. What topic would interest them enough to read 500 words about it? You will find that once you open the creative tap, the flow of ideas increases. When you have a brilliant idea for a blog, write it down in a notebook with some notes around it too so that you remember what it means when it comes time to blog. Together with a colleague we have successfully experimented with setting a timed session of 33 minutes in which we had to think of the idea, write the post, edit, tidy and publish. It worked. If you are already my client, let’s brainstorm a list of ideas for you. Once you get into it, tons of ideas will occur. Even my non-blogging friends now say “that would make a good blog” as they’ve heard me say it so often! Even when you think you don’t know what to say, keep writing anyway. Some days my blogs are duff. It goes with the territory. Keep writing anyway and better stuff comes. Yup. Dream on. Keep writing anyway. She visits now and again but never when you need and want her. But if you write, I promise you the Muse will visit. This year, 2014, I am blogging every day. I started on 1st January and my first visit from The Muse was 28th January. Go figure. I kept writing anyway. If you’ve got the Blogging Blues, the problem is that you are not writing enough. Keep writing and the blues will go away. It’s one of those. You’ll see it when you believe it, not the other way around.